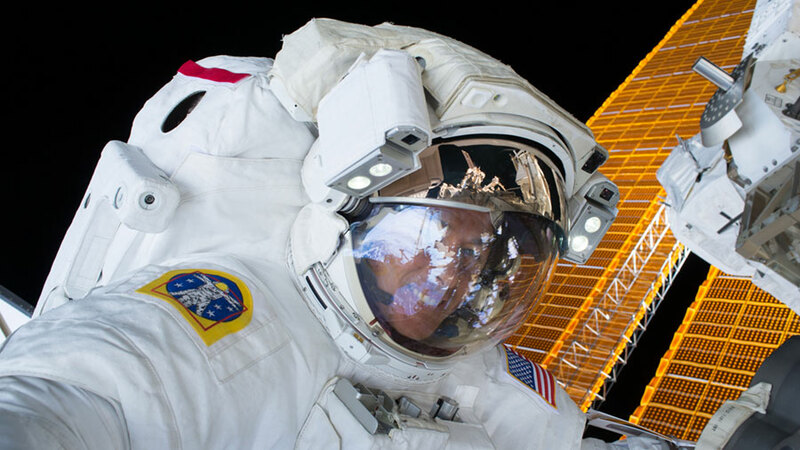 Astronaut Shane Kimbrough is pictured during a spacewalk that took place Jan. 6, 2016. Two astronauts switched their spacesuits to battery power this morning at 7:29 a.m. EDT aboard the International Space Station to begin a spacewalk planned to last about six-and-a-half hours. Expedition 50 Commander Shane Kimbrough and Flight Engineer Peggy Whitson of NASA will further prepare the space station for commercial spacecraft dockings, as well as perform maintenance and inspection. Kimbrough is designated extravehicular crew member 1 (EV 1), wearing the suit bearing red stripes and helmet camera #18. Whitson is designated extravehicular crew member 2 (EV 2), wearing the suit with no stripes and helmet camera #17. Follow @space_station on Twitter for updates. Learn more about the International Space Station online, including additional information about the current crew members.